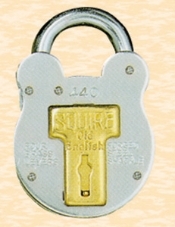 220 Old English 4 Lever Padlock. 38mm Width, 7mm diameter and 11mm length. Steel case, brass bolts and levers. 10 Year guarantee.